The link between mathematics and art can be divided into two sections: mathematics in art and art in mathematics. It is surprising how linked these two apparently distinct disciplines are. Firstly, let’s examine mathematics in art. This section can be further subdivided into the use of mathematics to create art and the presentation of mathematics in art. We will look at the former first. Mathematics appears in art from all periods. Take the Pyramids of ancient Egypt; by examining the proportions of the pyramids, one can find a golden ratio present. The golden ratio (approximately 1.618) appears in many unexpected areas. Take the number of seeds in a circle in a sunflower head and multiply by the golden ratio; this will approximate the number of seeds in the next circle. The reason the golden ratio is of interest to mathematicians is its link to the Fibonacci sequence. When you divide successive terms of the sequence, the ratio converges to the golden ratio. The golden ratio is found in lots of architecture, from the Mosque of Kairouan to Notre Dame, and in many pieces or art by Leonardo Da Vinci including the Vitruvian Man and Mona Lisa. Skip forward a few centuries to the introduction of perspective into art. Although this had been present in art for centuries, it only really took hold in the 14th and 15th centuries. The artist Lorenzo Ghiberti relied heavily upon Alhazen’s ‘Book of Optics’. The idea of perspective lies fundamentally in mathematics and physics. Spring forward further into the 20th century and to the works of M.C.Escher; his artwork contains so many references to mathematics it blurs the distinction between using mathematics and being mathematics. Escher toys with perspective and light to create artwork that seems impossible. Take Relativity (1953), which shows a bizarre connection of stairways in different directions showing different gravities and light sources. This art brings to life a paradox which maths often does too. 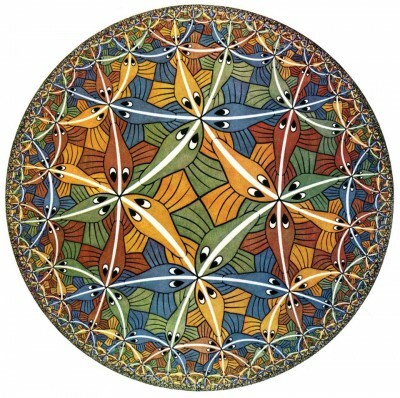 Another series of artworks by Escher are Circle Limit I-IV, which not only demonstrate very complex tessellations, but envisages them in the hyperbolic plane (a strange geometry where the angles in a triangle would add to less than 180°). Moving on from Escher to Dali; Dali uses mathematics more explicitly in his works. Take for example Crucifixion (Corpus Hybercubus), Dali shows Jesus being crucified on the 3-D representation of a hybercube. A hybercube is a 4 dimensional cube, and so cannot be seen by us, yet just as you can show the cube as a ‘net’ of 6 squares you can show the hypercube as a ‘net’ of 6 cubes. There is a link between the hypercube and God, in that the hypercube is in a higher dimension that we cannot understand, just as God is beyond understanding. Dali also uses catastrophe theory in his art. Catastrophe theory is related to the stable point of functions, and Dali’s Swallow’s Tail is related to the ‘swallowtail catastrophe’ of functions of the form V=x5+ax3+bx2+cx. The field of topology is full of interesting shapes and these are very often represented in art. John Robinson’s art focuses on sculptures of topological shapes. In our very own university we have a statue in the science site representing the Willmore 4-torus, a mathematical shape discovered by an academic of Durham University. And finally there are fractals; these appear in extremely diverse fields. The Mandelbrot set is a fractal shape that is referenced in art and literature, including Terry Pratchet’s Discworld series. Fractals produce such interesting and intricate shapes that many consider them to be art in their own right. This leads on into the idea of mathematics being art in its own right. This may seem like a strange idea but when you study maths you often hear of the aesthetics of mathematics with lectures describing a formula as “beautiful”. An example that stands out to most mathematicians is Euler’s Identity. This identity brings together 5 key concepts in mathematics (e, pi, 1, 0 and the imaginary number) into one simple, beautiful, formula. Another field that could be considered is statistics; taking a huge amount of ‘ugly’ data and processing it to produce a concise and accurate formula summarising a relationship could be considered art. But is art just about something being aesthetically pleasing? I believe not. Art is meant to raise questions and make us think.